Again I take an antipodal position against popular opinion without minding the anathema and invectives that loom over me. This fact-full, but emotionally packed and fustian write-up might be regarded by some as a satanic version; I don’t care because Ngugi wa Thiong’o has opined that every writer is a writer in politics. He however cautions that the politics must be one which sides with the down trodden. Yes. Our house (Southern Cameroon) is under the consumption of a gigantic fire and we cannot afford to chase the rats or pretend not to be scorched by the incineration. As a concerned parent and teacher I see the dire need to begin classes immediately. 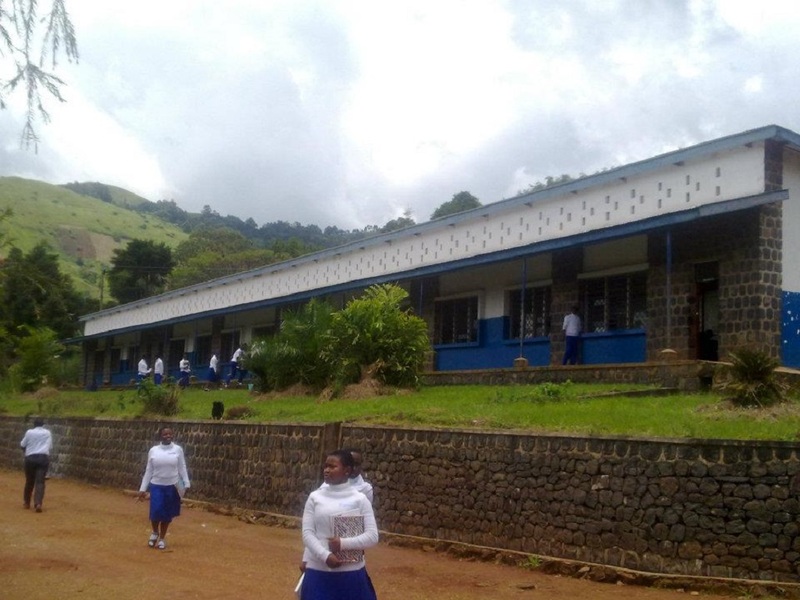 Varied reasons abound for both Southern Cameroonian teachers and students to descend to the classroom with immediate effect. Southern Cameroonians lack basic school infrastructures, talk less of stationery. The University of Bamenda, for example, harbors many institutions of higher learning. It is sad to say that the same old structures that were constructed by the Germans donkey years ago are the same ramshackle buildings this prestigious institution is still using. At times students huddle under trees to attend lectures, or they are simply dismissed for lack of where to attend lectures. A tour of schools in the entire region will live one wondering if we are still in the Neanderthal age. The dilapidated structures, which also pass for schools, even in the South West Region is a direct smack on the face. Children attend classes while sitting on dusty and jigger-infested floors. Though timber is exported from this region by La Republique and auctioned to France. Students in this part of the country lack benches and roofs on the huts which purport to be classes. These are the state of putrid schools that awaits teachers and students come January 9. Oh! good old Southern Cameroon so close to God, but far away from heaven. Should have Higher Education Curricula after 4 decades plus of existence. Teachers and students in Southern Cameroon must go to school now because they are the “extremist minority being manipulated” by some individuals. The privileged francophone children of cabinet ministers and those who matter in the society in La Republique have flooded Southern Cameroonian schools. These students are waiting for the much cherished Anglo-Saxon education to be taught by Southern Cameroonian well-cultured teachers. Yet these teachers are the extremist elements and enemies in the house. In that light, we have every reason to go back to school to teach and nurture Francophones so that they turn round and bite the finger that fed them. After all, we are “Anglofous,” “les biafras” and all what not. We must go to school and teach them to continue to lord over us. It is high time we went to school because we have been coerced to do so. Education goes with a relaxed and conducive atmosphere. Unfortunately, La Republique does not know this cognitive code teaching method. All strategic sites and schools in the major towns of Southern Cameroon are flooded with heavily armed military men from La Republique. Any new comer to Southern Cameroon being riddled with machine guns and water cannons all over the militarized zone will conclude that a Third World War is at hand. The atmosphere is stifling. The same soldiers who committed untold atrocities in Southern Cameroon by openly brutalizing our lawyers, seizing their robes and wigs are there to protect us as we lumber to school come Monday. Students in southern Cameroon should go back to school to study under intimidation, blackmail, and threats. The mistreatment meted on lawyers awaits teachers. So come Monday the 9th, Southern Cameroonian teachers should go to school to be dished with what our honorable men of the bar experienced. Southern Cameroonians have been tortured, maimed, raped, and even grisly killed. Soldiers went into innocent students’ rooms inflicted excruciating pains on them, looted property, destroyed phones, and left indelible marks on them. Southern Cameroonians are anxious to be raped again by officers of law and order. Southern Cameroonians are eager to be served with tear gas and irritating water from canons. Southern Cameroonians are begging to be tortured. That is why they have to go to school now. The mistreatment and brunt of humiliation they bore a few weeks ago was not enough. Ha, do I hear myself echoing that there is no Anglophone Problem, and hence no marginalization of Southern Cameroonians? We have to begin school forthwith for the educational genocide in Southern Cameroon to continue. Southern Cameroonian Students and pupils must go back to school to be untaught. They must study English Language in French whether they like it or not. French, the language of oppression, intimidation, and corruption is the language that awaits them as they scurry into their classes. I wonder how these poor Southern Cameroonians will ever understand concepts in biology, chemistry, physics, maths, history, literature tatati tatata given that the subjects are taught in French by inexperienced and unqualified teachers. No doubt these breed of Southern Cameroonian students will remain caged till doomsday. How will these ill-fated Southern Cameroonians ever fit into the ever dynamic world? Only La Republique with its linguistic experts and congenital mythomaniacs can provide an answer. We must go back to school because we are not and shall never be the leaders of tomorrow. The past, present, and the future is bleak. For 35 years (from infancy, adolescence, and adulthood) we have been under the yoke of the same tyranny; being fed the same old lie that we are the leaders of tomorrow. The same ministers keep changing portfolios. Some wallow under the cornucopia of multiple posts while we continue to go to school to either end up riding bikes, driving taxis, or doing mean and odd jobs. In such conditions, we will never ever have the money to officially bribe to go to professional schools like ENS, ENAM, EMIA, IRIC (all French acronyms). We should quickly go back to school because we cannot be ministers of basic education; we cannot be ministers of secondary education; we cannot be ministers of higher education. The handful of us who manage to find ourselves in ENS have to be in Yaunde daily chasing files or looking for money to bribe again to become the sub of sub directors or assistant of assistants to our East Cameroonian counterparts. Southern Cameroon has been retrogressing for the past 55 years. Anything that is auspicious there is either carted to East Cameroon or outrightly destroyed. We must go back to school because we are a good-for-nothing people. We have to be tortured and humiliated before the GCE Board was grudgingly given to us. We have to be raped, dragged in sewage, afflicted, and killed before the president can demonstrate his largesse by going to his daughter’s pocket allowance and nibbling a paltry two billion FCFA from there to pacify us. Perhaps we should applaud the head of state by going to school, and with “unflinching motions of support” for his magnanimity because he has used his hard-earned money to provide us with laptops and now two billion. Little known Rwanda, and even Equatorial Guinea, know the importance of education because their teachers and students attend schools in decent environments. Which governments bribes authorities for teachers and students to go to class? Which government, except La Republique, coerces and threatens both students and teachers to go to class? Impossible is not La Republique. I don’t want to be a fool forever. I WILL NOT GO TO SCHOOL COME MONDAY 9 AND THE DAYS AHEAD so as to be tortured, raped, riddled with grenades, tear gassed, or even killed. I will not also be the blackleg to sell my country and progeny. Unless there is a genuine change and quickly too, I WILL ONLY GO TO SCHOOL IN 2035 of grande or greater ambitions. Forgive my French lapse for I was fortunate not be taught literature in that wily and abrasive language. The Intent of France is to wrap up Anglophones into her evil policy of Assimilation which keeps all French Colonies Bound to France. The arm they are using is their bunch of Stooges headed by the Unenlightened Mbiya. Unfortunately, France has never learned their lesson in Warfare. They keep losing, Battle After Battle, War, after War. Francophones do not know this fact about Bully France. We, Anglophone do. As our “Former” Colonial Master…Britain, we do not give up! France has lost the War Over Southern Cameroons, forever, because she always deceives herself that Brute Force could Subdue all humans. To Anex Southern Cameroons, they might have to Kill Everyone, seeing they have never learn the Concept Peaceful Diplomacy or Dialogue. We are determined to go right through with this Resistance. – literally, like Keyeke’s call “pupils must go back to school”, the choice , placement and linkage of words .stir to the surface in one ugly swoop, all the pent up ugly emotions … leaving the reader dizzied, bamboozled, dumbfounded. Even as Timothy might be haughty and abrasive, he is also bold and authoritative —and refreshing. Couldn’t have picked a better form and time to remind us zat we too should have go/gone/went/ going back to school ourselves last Monday . Shalom! This work of Art should be included in the next edition of the poetry text titled: POEMS OF BLACK AFRICA. Words if taken for granted may place us into very improbable situations. I applauded the maturity in the caption, then wondered if parents were even concerned their children have lost a year not schooling… May God be our HELP today! What an incisive and classic write up full of sacastic and ironic spins. Salivating for more bro keep it up. This work is a synopsis of what the southern Cameroon’s have been going through for more than 50 years but I think enough is enough,great piece of writing. Kudos. The truth and nothing else except the truth shall prevail! Well said! This piece of literature is nothing but a BULLET from heaven. This of literature is nothing but a BULLET from Heaven. Someone need to translate this into french and sent it to Yaounde or french news agencies. The truth is hidden inside the pudding. Well written….Ambazonian style! Perfect Caption! WE CALL THIS HIDDEN TRUTH OR BETTER STILL GOLD HIDDEN UNDER TRASH. LET THE WISE DIG DEEP(READ TILL THE END ) TO DISCOVER THE GOLD. Powerful but hidden. Don’t be surprise if someone calls you up for supporting the government because I almost did. That’s what happens when pros play with kids. Wao excellent trap, I strongly believe that with this strategy something has to be done is my prayer, specially this strike shouldn’t be in vain, this should be an opportunity for the anglophone people to com out from slavery. With God all things are possible. Thank you Sir. If all depended on the caption I wouldn’t have gone beyond the title. But thanks to a previous reader’s comments on what’s hidden behind the title, I decided to click the link. Behold such a rich content packaged to flatter La Republque and some of our elites who dine and wine with the regime. WE CALL THIS KIND OF MESSAGE GOLD HIDDEN IN THE EARTH OR STILL HIDDEN TRUTH. I ENCOURAGE THE WISE TO READ TILL THE END. Caution! This is however strictly for the intellectual. Waaaaawooo, black legs take note. The struggle for freedom of southern cameroon is stronger niw tha. Ever. Waaaaaaaaaaaaawooooooooooo. This is a very big eye opener for black legs who are a draw back to our struggle. The fight is on. While we’re savouring and pondering on this reflection given to us by the author of this write-up by name Timothy Keyeke, I want to urge Mr Wanaku Verdzekov to abstain from Intellectual Dishonesty and reacknowledge the real author of this write up. We have to respect and encourage writers like this who can paint a true image of our “struggle and sufferings” in black n white. If anyone wants to reachout ideas to Timothy Keyeke so that he can better coil it to more write-ups, inbox me at princendofor@gmail.com or search Timothy Keyeke on facebook. Our nation of British Southern Cameroon is ready to be built with human and intellectual resources which surpasses all the foreign financial aid La Republique du cameroun has been receiving for over 60yrs. This is intellectual dishonesty Mr. Wanaku Verdzekov. You are not the author of that article. I think you would have at least contacted me, its architect, before publishing it under your name . There you are. Received the said post with no author. Given the timing it was necessary to get it out there sooner than later. Thanks for taking the time. Great job to the author. Though suppressed, we’re no dooms. Southern Cameroon have been running on their own from inception with no body to “drive the flies from their tail” if not God. A people tricked and exploited of their own resources for too long a time. A people who are ridiculed, laughed at and branded as foreigners with the direct and indirect support of the president. A people who feel and live more valuable lives as human being outside their country, even though the country pretended not to be at war. A people who are criminals without a crime committed, victims of no circumstance apart from that they were against their will joined to a system unrelated to theirs called LRC. A people whose goodwill and good character has earn them the mocking ethnic appellation ” led Bamendas” which means foolish people. Let God speak for them and deliver them from the hands of strange rulership like he did to Esther and the children of Israel in Barbelon. You have said it all; I applaud you! I love the use of irony to criticise and discuss pertinent issues affecting Southern Cameroon! You have made my day! Thank you very much!!!! Brilliant, succinct, irritating from the caption but rich in content and context as one reads through it. It is a wonderful piece of Literature that helps to reawaken those sellouts of Southern Cameroon. I love the Irony used in presenting the fact. We thank God for Intelligent son’s and daughters of SC. Enough is Enough. Wow wow wow, the caption got me pating as to what’s happening?? Are we selling out on ourselves?? I was so glued to my screen to digest the poetic justice write-up as I can termed it. This is a masterpiece and very much emancipating. Thanks so much. Aluta Continua. No bullet from even a tank can be more effective on its target than this satire. Can you imagine that afoakom, an in animate object can be more animating than some of us living objects? More from your rich pen sir. This is brilliant,well written. Copies should be sent to those governors,sdo,do and some of the traditional rulers. Till the Re-Instatement of our Independence,not only schools but also LRC’s institutions in our territory must remained closed. Great writer And a true anglophone spirit. Read the caption and thought here comes the first outright sell-out whereas it’s a summary of all the atrocities by LRDC that will be used on them at the ICC when the time comes. Brother, you are a soldier of West Cameroon at the frontline (geographically – West Cameroon). The caption almost got me entombed in my body and I could hear me screaming ‘here we go again ‘.But for a moment I managed to hold on to my breath in complete fear then the truth behind the paradox began to unravel and my arteries slowly started to dilate and I revived.As script ended I could hear myself eulogising ‘amazing grace how sweet the sound….and I didn’t want it to end. Great write up. We will take a step back to leap forward in the future. I wonder what pros and cons analysis La Republic can put forth that a federal state is not the best solution. Our eyes are open now and will never close. No more answers La Republique. Let them send their children to study in Nigeria or Ghana for all I care. For now there is no school here. The title made me squirm only for a wide smile to spread over my face. Sarcasm at its best which at hear mimics Socratic wisdom. Thanks for this. I don care how the content goes. Your headline is misleading at this point in time and is nothing but self-seeking. Despite what others have said, I give a thumbs down To this article. Perfectly correct and straight blow to La Republic face…. lets keep this struggle alive until measures are put in place…. The Caption almost scared me away, but i decide to keep reading atleast since the opinion of others also matter. After the second paragraph, realized that the writer was if am right, of the Bate Bessong generation. Kudos! A master piece that captures the humiliation Southern Cameroons and Southern Cameroonians go through daily. The writer reads the mind of the enemy and prepares the heart of the victims of torture to know that freedom is never received on a platter of gold. There are sacrifices to be made, including the education of kids, and even lives. That’s how the famous GCE Board came; that’s how the University of Buea was created – on the blood of innocent people. I cried!! !,, I have been blind, now I can see. I was almost pulled out of my seat by the screaming caption of this write up…but the body contents rather “super glued” me to that same seat as i devoured the pertinence of every line of it!!! In short,i’m more resolved now than ever…! Wao ,I did technical education,I guess this is poetry full of comedies and tragedies. The caption at first sight I must confess is irritating but the content is very enriching, how do we get our brethren to go through I’m sure all will fight till the last drop of their blood for justice to prevail. Wonderful piece! Thank you for informing us in such an ironic tone. Go to which school? How many schools in West Cameroon are built by government? ANSWER ME, CMEROON? All schools in West Cameroon are built by a non-profit organizations from aborad, religious denominations, or by the parents of an area coming together to put their resources to build schools. All the government does is provide the teachers it hardly even pay its slavish salaries, if at all. In addition, it floods those institutions put up by private resources with children for LRDC. Let LRDC show which school buildings it did put up for our children in West Cameroon for their education? I’d rather die than succumb to this bestial, brutish beasts of LRDC. Those West Cameroonians who are allying with such nefarious enemies of our beloved West Cameroon must be noted and be brought to book soon. WELL PTA has been the backbone of the west Cameroonian education. School are only granted on paper but never built by the la republique government. I can understand them now(you no go give monkey teeth for come take bite u one) They knew that if we get proper education, we shall one day start asking questions like it is the case today. Dear Brethren the time is now and no turning back. We are many outside prepared teach our kids without salaries in our nation!!!! Mr Zama read before you can comment, his a great writer who decides to use poetic language in fighting our same course. Very captivating headlines that would attract our so called elite to want to read, only for them to realize that it is far from their devilish expectations. I wonder what some of them really want? Preservation of their dubious post. Thanks a lot sir,we need more if such stuff.